The first study collected data from 1999 though 2002 with the expanded study done from 2003 to 2005. The lead investigators for both studies ere Dr. Richard Sarnat, MD and Dr. James Winterstein, DC. 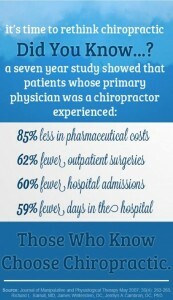 For the entire 7-year study period from 1999 to 2005, patients who utilized chiropractors as primary care physicians had 60% fewer hospitalizations, 62% fewer outpatient surgical cases and 85% lower pharmaceutical costs. Incidentally, chiropractors also had higher patient satis faction scores, too. Here’s what Dr. Sarnat had to say about the findings: “I have always believed that the over-utilization of pharmaceuticals and surgery, and the underutilization of more natural healing techniques, such as Chiropractic, has been the cause of great suffering. Yet, I had no idea that the magnitude of both clinical improvements and cost effectiveness would approach 50% in both cases. If you have questions about chiropractic care and how it may help your health concerns, feel free to give us a call to set up a consultation with Omagh Chiropractic. Our patients here often comment on how much they appreciate us going the extra mile in making sure your questions are answered and you completely understand what your treatment is, how your treatment works, and why it works. We want to work together with you as a partner in your health, and as an informed patient. Search through our website to read more information about our services and how we’ve helped others in the community with their health needs.